Movie: "Requiem for a Dream"
A look into the lives of four drug addicts living in New York City. There are movies, and then there are movies that deal with drugs. We always have a hard time watching movies about substance abuse, but if we're going to watch one, we might as well make it one of the best, right? 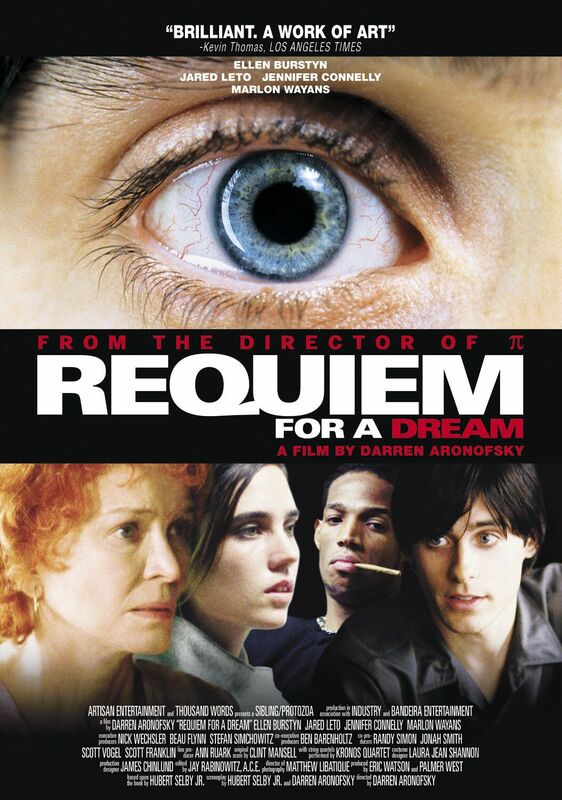 "Requiem for a Dream" is directed by Darren Aronofsky, who has created a dark and chaotic film that examines the lives of four drug addicts living in New York City. It is based on the book of the same name by Hubert Selby Jr., who also wrote the screenplay with Aronofsky himself. The film stars Ellen Burstyn, Jared Leto, Jennifer Connelly, and Marlon Wayans as the four aforementioned drug users. Leto plays heroin addict Harry Goldfarb, who has big plans about how to make money by becoming a dealer with the help of his fellow heroin addicted friend Tyrone, played by Wayans. He also wants to help his coke-addicted girlfriend Marion, played by Connelly, so she can get her clothing design business up and running. Harry's mother Sara, played by Burstyn, has a different kind of addiction which begins with her obsession with television. When she is contacted by a man who says she will get to appear on TV as a contestant on her favorite show, hosted by Tappy Tibbons, played by Christopher McDonald, she decides to get into shape so she can fit into the red dress she loved to wear with her husband when she was younger. With the help of a shady dietitian, she gets prescribed weight loss drugs, which are actually a form of speed to which she quickly becomes addicted. "Requiem for a Dream" takes a look at many forms of addiction and the depths a person may sink as a slave to drugs. The acting is fantastic from everyone involved, but it was Ellen Burstyn who received a much deserved Oscar nomination for her portrayal of Sara. It is such a crying shame she didn't win that year, eclipsed by Julia Roberts in "Erin Brockovich." Leto, Connelly, and Wayans' performances are not to be ignored. Each of them brings their own level of hard to watch manic and/or depressing to the table. There are many parallels in Aronofsky's directing style between his first film "Pi" and this, his second feature film. He uses numerous quick cuts when someone is popping pills, shooting up, or snorting their drug of choice. This directorial and narrative style adds a certain level of chaos and unease to the madness of the film. We are not ones to partake in mind-altering chemicals, and this movie may be the closest we ever get to experiencing anything close to it because it is certainly a trip. It certainly serves as an anti-drug PSA in many ways, displaying the dismal depths people are willing to go to and showcasing the most abhorrent things people are willing to do to score their next high. It takes an artful approach to the subject, creating beautiful visuals and unique camera work by cinematographer Matthew Libatique. We can genuinely feel the highs and lows the users go through on a daily basis. When they hit rock bottom, they hit it hard. Luckily, Aronofsky fought for the final product of this movie when the MPAA wanted to cut scenes because they were too much for an R-rating. Aronofsky has stated these alterations lessen its impact of its ultimate message. The last 30 minutes of "Requiem for a Dream" are depressing, degrading, disgusting, and hellish, unrelentingly so. These final moments make this a difficult film to watch more than once. Every time we watch it, we feel so dirty when all is said and done, but that just means Aronofsky did a damn good job telling this sordid tale.